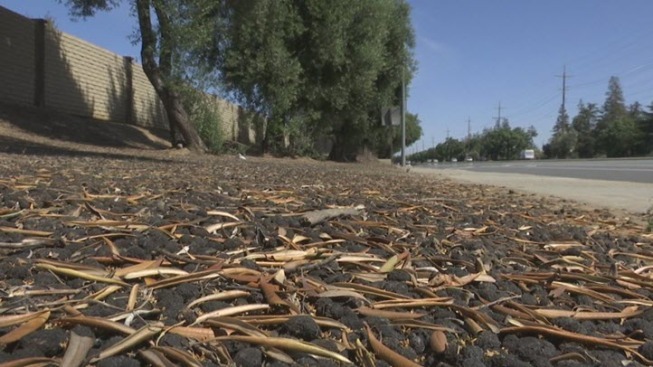 More than 100 people from a South San Jose neighborhood have signed a petition to save the 35-year-old trees, which line five blocks of Monterey Road. After hearing about San Jose’s plans to remove 200 olive trees, some neighbors are trying to save them. “The neighborhood could help sweep and take turns,” said Debra Guerra, who has lived in the Silver Leaf neighborhood for 17 years. She and more than 100 other people from the South San Jose neighborhood have signed a petition to save the 35-year-old trees, which line five blocks of Monterey Road. They say taking them out would expose the wall behind the trees to graffiti. “I don’t see any reason why they should take them out. They’re not bothering anybody,” Guerra said. But the trees do bother some neighbors. They preferred not going on camera, but told NBC Bay Area they have slipped and fallen on the olives. “That is completely unsafe and that’s not something we want to allow, let alone promote,” said Russell Hansen, who has worked as San Jose’s arborist for 15 years. Each year he has worked for the City, he says a handful of walkers, commuters and cyclists have complained about the olives, which fall for roughly six months out of the year. “Ultimately, [cyclists] prefer to ride in the lane of traffic versus staying in the bike lane because if they get far enough away from the olive pits, they’re not as worried about falling off their bicycles,” Hansen said. Hansen says the landscaping department is so understaffed that they can’t keep up with the falling fruit. And this year, the City finally set aside $70,000 to replace the olive trees with redbuds, gingkoes and maples – trees that aren’t so fruitful. This plan, he says, is more cost effective in the long run. Still, some neighbors don’t buy it. “I don’t trust that whatever we get in replacement of the olive trees will be any better than what we have. Frankly, I fully expect it to be worse – likely far worse,” said resident Dave Marnatti, who thinks the City is too understaffed to maintain the new trees. Hansen says the new trees will require cleanup about twice a year, rather than twice a month like the olive trees. The City is considering keeping about 60 trees, which are set farther back from the sidewalk and road. Its final decision about the olive trees will be made next Friday. Tree removal is tentatively scheduled for June 6.